London - South African athlete Willem Coertzen finished ninth overall in the men's decathlon at the London Olympic Games on Thursday night. 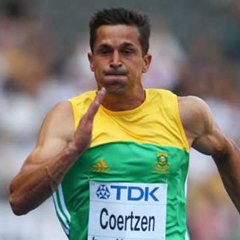 The 29-year-old Coertzen, who holds the SA record in the event, finished on 8173 points, 696 behind American winner Ashton Eaton. Eaton (8869 points) finished ahead of fellow countryman Trey Hardee (8671 points), while Cuba's Leonel Suarez (8523 points) claimed bronze. The South African ended day one of the event in 11th place and made a superb start on Thursday, winning his 110m hurdles heat in a new personal best (PB) time of 14.15 seconds.